While legally a "village," Lewellen was recently described as a "micropolis" by the Omaha World Herald. We love that term and it captures the unexpected to be found in a little community of less than 200 people. Located just 30 miles off Interstate 80, at the west end of Lake McConaughy, visit Lewellen and Garden County - pristine nature, pioneer history and becoming the Mayberry-Taos of Nebraska! Favorite places - Ash Hollow State Historical Park, Crescent Lake National Wildlife Reserve, Lake McConaughy and Clear Creek Wildlife Management Area - all great for nature and birding. While in Lewellen, visit 17 Ranch Winery and the free swimming pool. 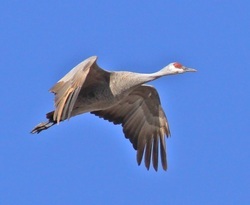 Sandhill Cranes by the thousands in Lewellen area.